This week and last, Badgerdog has been fortunate enough to meet several marvelous poets visiting Austin as part of the Austin International Poetry Festival (AIPF). In addition to the poets’ readings and workshops with AIPF, these unforgettable folks volunteered to visit our Badgerdog students during their weekly workshops. The results were truly stunning. Students were enthralled by their visitors and encountered new worlds (and words) filled with inspiration. 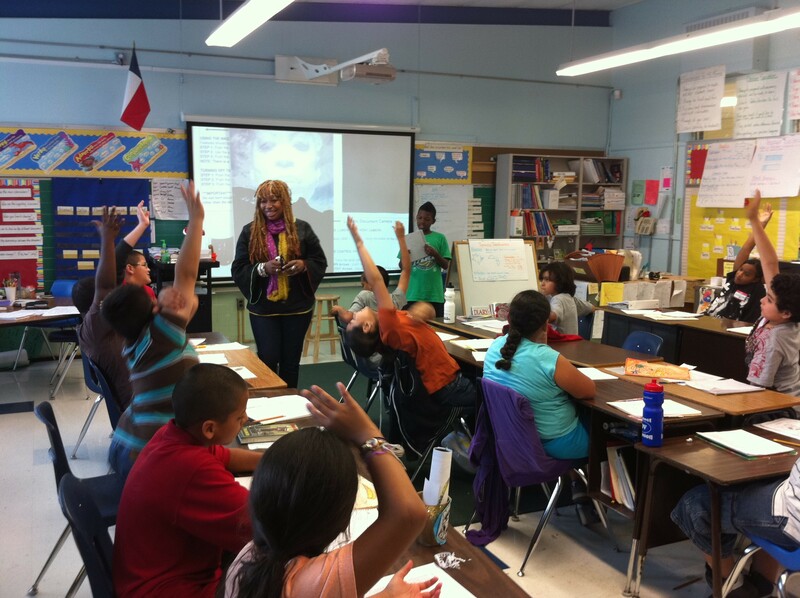 Last Thursday, poet Tantra Zawadi, who traveled to Texas from her home in Brooklyn, NY, stopped by our fourth-grade workshop at Ortega Elementary, where she introduced students to Native American poetry then led them through a beautiful exercise in imagination and creativity. Each and every student shared their poems with the entire class. This week, we are excited to bring you the student poems inspired by Tantra’s visit. We also want to thank AIPF for sharing their poets! They sell me for money. I make glistening rain fall. I cover up the sky. I make thunder produce lightning. I make the earth wet. I bring joy to dry places. I only appear after it rains. I am curved, not straight. You can hear me in a storm. I am everywhere there is a storm. I am bright and shining. You wear sunglasses when I am out. I am out all day, but not at night. You might sneeze when you look at me. I can get you wet. I live in a cloud, and I fall on your head. I drop from the sky on cloudy nights. You wash your body with me, and you drink me. I get your hands wet when you wash your hands. I evaporate, go in the clouds, and then go back down. I am the opposite of down. I make your face look pretty. I roll all over the world on everybody’s face. What an amazing visit we had with Tantra. Magnificent writing, Ortega Badgerdogs!